The Nissan Juke is a true crossover. At first glance it looks like a sporty, two-door coupe—until you notice the nearly hidden rear door handles. It also has the deep wheel wells and tall profile of a small, Jeep Wrangler-like SUV. And that’s the point. The Juke crosses over different car categories (compact car, crossover/SUV, sports car) to create an almost entirely new style of vehicle. The base model SV with front-wheel drive is priced at $19,998. 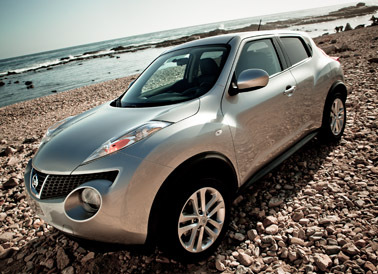 The Juke version I drove was the AWD model, which starts at $26,778. All four trim lines are equipped with a CVT (continuously variable transmission). Unlike CVTs on some other cars, the Juke’s is quiet and doesn’t drone at higher speeds. The 1.6-litre, 4-cylinder direct injection gas engine is turbocharged and provides strong acceleration and ample power, even in “Normal” mode. Two other engine modes are available with the push of a button on the centre console, Sport and Eco. In Eco mode, the engine’s power is reduced slightly to maximize fuel economy–perfect for a short daily commute. The Juke’s exterior design is striking. Four headlights give the impression of two sets of eyes keeping watch on the road. Two of those eyes protrude longitudinally from above the front fenders with two circular lights below. But the design also creates some challenges. The low, sloping roofline that looks great from the outside also makes the back seat feel cramped, as does the way the cabin narrows towards the rear. A child can sit comfortably back there, but an adult would feel cramped on longer rides. The interior design could use some work too. While the navigation/audio system is easy to learn, its buttons are small and hard to use while wearing gloves. Also, for a car that boasts such a high-tech look and is fitted with an array of toys, why are there no power adjustable seats? It seems odd to use a key fob and a start/stop button; change your driving mode with the push of a button and then resort to using a hand crank to adjust the seat. Speaking of the start/stop button, it’s located in an awkward location behind the windshield wiper stalk, making it hard to access without hunting around for it. Same goes for the switches for the heated seats. They’re located between the front seats in the centre console meaning the driver has to reach down and back to turn them on and off, taking their eyes off the road while doing so. The rear backup camera (standard on the SL trim levels) is a great feature, even for a small car like the Juke. The cargo area is small, but is nicely concealed by the cargo cover and tinted windows. Overall, if you’re looking for a family hauler, this isn’t the car for you. But if you’re looking for a small car that’s sporty enough to feel like a sports car with available AWD and the tall stance of a crossover, look closely into the four eyes of the Juke.